A native of Japan, Yuko Kishimoto is a classically trained pianist with experience in jazz, pop, French cabaret, and Broadway musicals. She earned a master's degree in piano pedagogy and a bachelor's degree in piano performance from Michigan State University. She performs as a soloist, accompanist, as well as a band leader of her own combo (trio and quartet), appearing frequently at local venues such as Justin's, Midtown Tap & Tea Room, 74 State, among others. Also active as a composer, her original compositions have been performed by Keith Pray's Big Soul Ensemble, Michael Benedict's Jazz Vibes, and Nicole Peyrafitte, as well as her own groups, and broadcast on WRPI, WCDB, and WAMC. 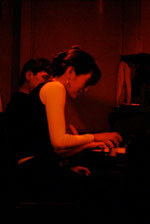 Some of her works have been recorded on Keith Pray's Big Soul Ensemble's debut CD "Live at Lark Tavern" released in 2010, and Michael Benedict's "New Phase" released in 2008.